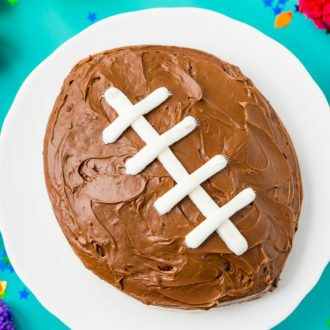 This Easy Football Cake is the perfect game day dessert! Use this simple step-by-step tutorial to make this recipe for your next football party! 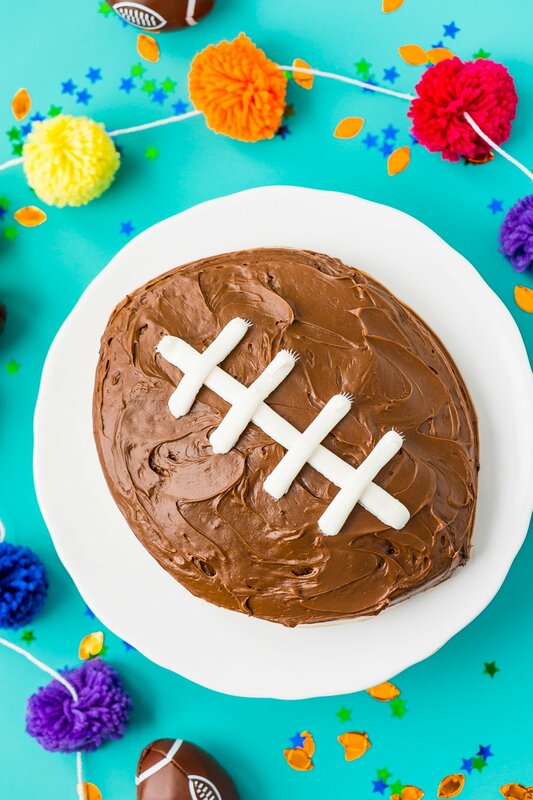 This Football Cake is such an easy recipe to make for game day parties or football themed birthday parties. Make a couple of single layers or a double layer cake! Can you believe Superbowl Sunday is just around the corner? Have you started planning your menu yet and inviting your friends over for the big game? 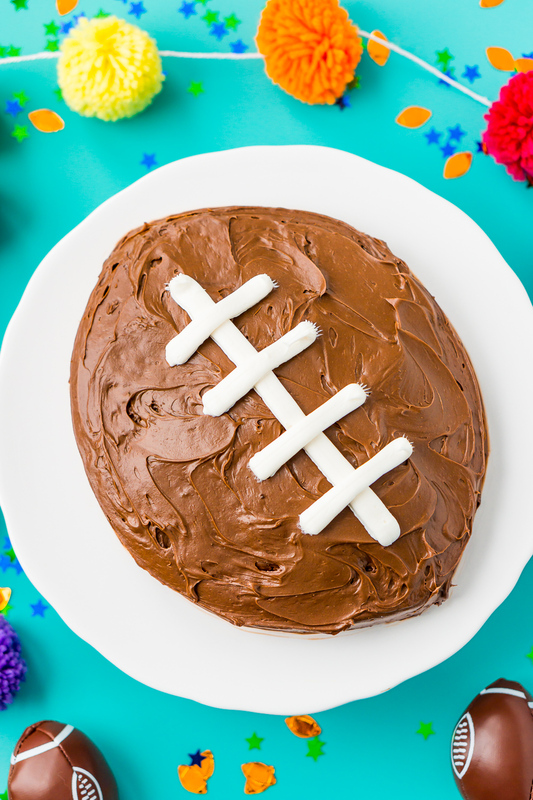 This Easy Football Cake is a moist chocolate cake topped with the Best Chocolate Buttercream EVER makes for the perfect plate of sugar to root for your favorite team with! With Super Bowl just days away, we’re all planning our menus and inviting people over for the commercials game. Sometimes it’s easy to forget that game day food is more than just meat, cheese, and chips; you gotta have dessert too! I completely understand how crazy things can get when you’re throwing a party and trying to get everything picked up and made. That’s why this cake is perfect because it’s just so easy and takes so little time! As I said, this is a really easy cake to make and you can do a few different things with the batter. You can make two single layer cakes or one layer cake or you can make a single layer cake and a dozen or so cupcakes! You can also use the recipe in this post (my favorite doctored up chocolate cake recipe) or you can use a simple box mix! Begin by preparing your cake batter according to the recipe direction below or the box instructions. 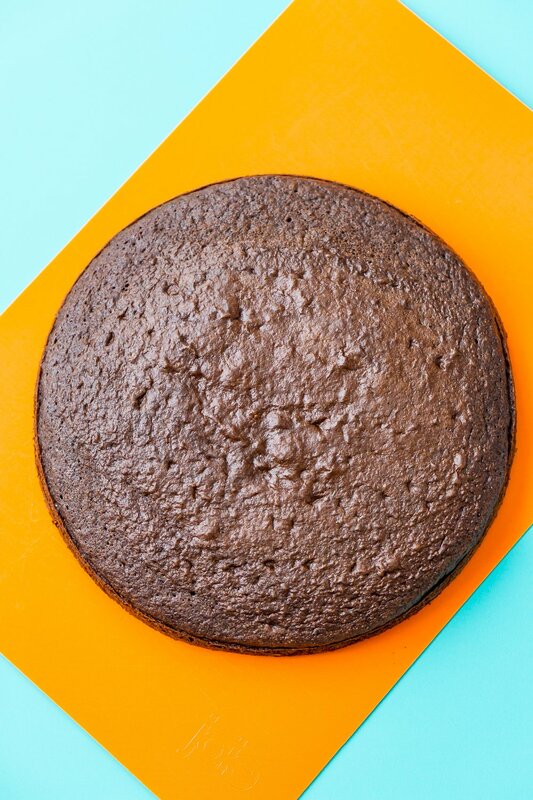 Divide your batter between two 8 or 9-inch round cake pans or one round cake pan and 12 cupcake liners and bake. 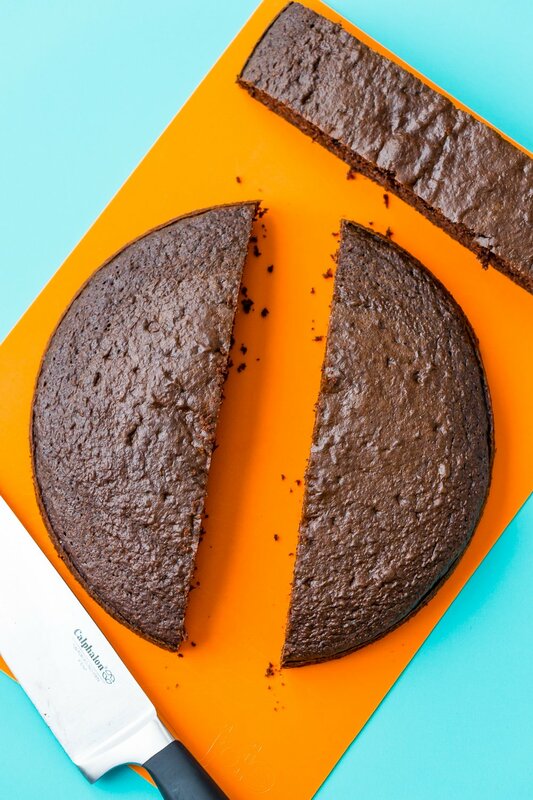 Once baked, use a large knife to cut a 2-inch thick strip out of the middle of the cake, if you are making a layer cake, make sure the strips are the same size so the remaining pieces will be the same size for easier assembly. 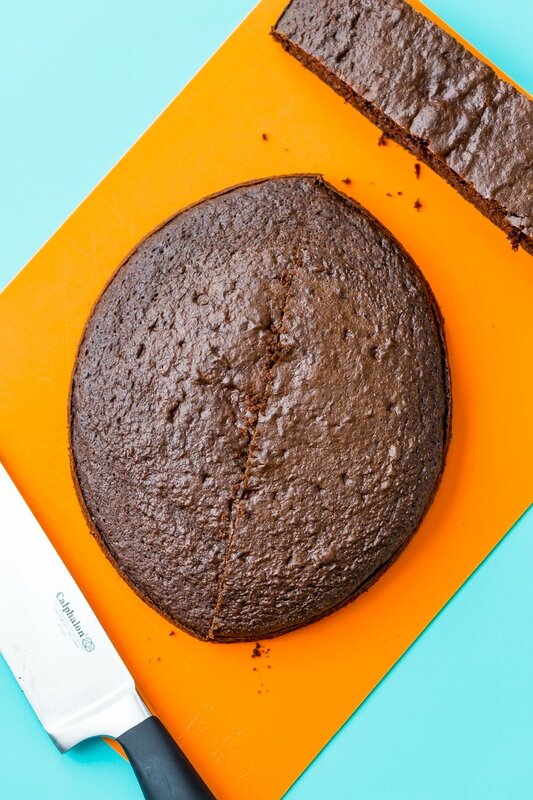 Then you’re going to push the halves of the cake together, you can secure them by putting a little frosting on the cut edges before pushing together. 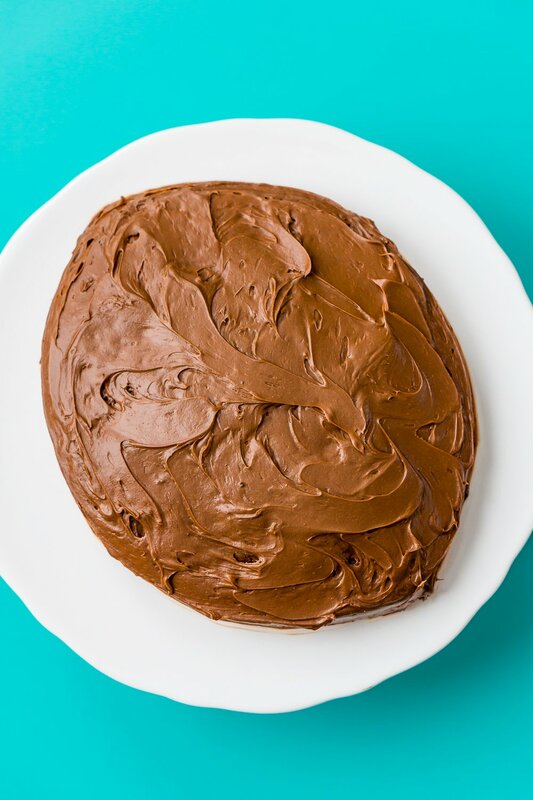 Next, you’ll make your frosting (or use store bought – that’s fine too) and frost your cake with a frosting spatula. If you make a layer cake, frosting the top of your bottom layer then put on your top layer and frost all over. I recommend frosting on the dish you plan to serve on. Finally, it’s time for the last step and that is to pipe on your football stitching with white frosting. I usually just buy a tub of frosting from the store since you need so little frosting it’s never worth it to make to make a big batch of Vanilla Buttercream, but you can if you want to. See! How easy was that! 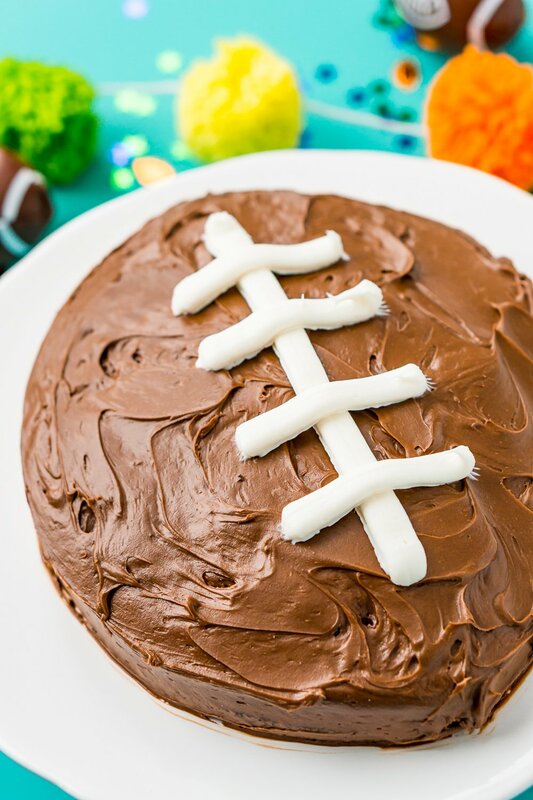 it really only takes about 15 minutes to put together this football cake after cooking and cooling. So who’s excited about the game? Being from Maine, it’s pretty crazy up here with anticipation – Unless you’re me ;). Personally, I’m in it for the commercials… oh, how those Clydesdales get me every time, amirite? Anyways, if you’re looking for more great game day recipes take a look around or check out these Football Stadium Cookies! This post was originally published January 24, 2015, and was updated on January 22, 2019, with fresh photos and content. Preheat oven to 350 degrees F and line cake pans with parchment paper (see instructions here) and coat with cooking spray. Combine all of the cake ingredients in a large bowl or stand mixer fitted with a whisk attachment and beat until combined. Evenly distribute cake batter between the pans, two 9 in. pans should be for about 30 minutes or until toothpick comes clean. See notes for other sizing and times. Remove from oven and move the cake pans to the cooling racks to cool. Once pans are cool enough to touch, gently flip the cakes out and let them cool completely. Put a plate or cooling rack over the top of the pan while flipping. Prepare the chocolate buttercream recipe. Cut a 2-inch wide strip from the center of the cake(s) and push the two ends together as shown in the photos above in the post. On your serving dish, set the cake on two pieces of wax or parchment paper so that the line of the cake is perpendicular to the line where the paper meet. Frost cake(s) with a frosting spatula. If you're making a layer cake, frost the top of the first layer then add the second and frosting the whole cake. Use a flat ribbon tip to draw on football stitching. You can use my recipe above (which you should) or you can simply use a box cake mix and your own homemade or store-bought chocolate frosting. It’s really the method that makes this cake so EASY! You can make any size you want, a huge 14-in round cake (baked for 50 to 55 minutes), a bunch of mini 4 in round cakes (bake for 25 to 30 minutes), or do what I did and make two 8 or 9-in round cakes! 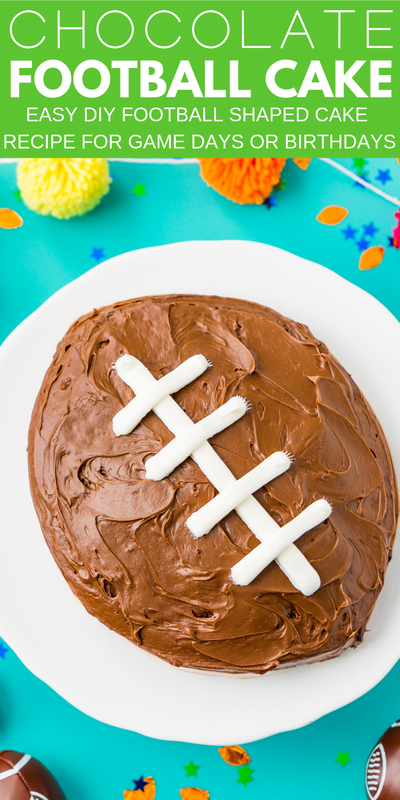 You can also make one single layer 9-inch football cake and 12 cupcakes. Cupcake should bake for 18 to 22 minutes.